A urine specific gravity test is a painless way for a doctor to check how your kidneys are diluting your urine and how your kidneys are functioning. In order for our bodies to work properly, they must contain the right amount of water. The kidneys have the important job of removing excess water from the body or retaining it when the body needs more fluid. When the kidneys are working well, extra minerals like sodium and potassium leave the body in the form of urine. A urine specific gravity test—or urine density—may be performed if a doctor suspects you are dehydrated or have a condition such as heart failure. Basically, the test compares the specific gravity of urine to the density of water. Urine that is too concentrated could signal that your kidneys are not functioning properly. It could also simply mean that you aren’t drinking enough water. When you undergo a urine specific gravity test, you’re required to exclude certain things from your diet, and you may have to temporarily stop taking certain medications. In some situations, urine density will be tested several times in one day. This can give doctors a good idea of how well the kidneys are compensating. Preparation for the urine specific gravity test is simple. You will be asked to stop taking any medications that might interfere with the results, including those that contain sucrose or dextran. If you have recently had intravenous contrast dye for an X-ray or MRI, you will have to wait at least three days before having the urine density test. It is also advisable to eat a well-balanced diet leading up to the test. Certain foods do have to be eliminated from the diet, including beets, blackberries, carrots, fava beans, and rhubarb. Many people worry that the test will be painful or uncomfortable, but that is not the case. It is really no different than giving a regular urine sample. When you visit your doctor for a regular check-up, usually a urine sample is required. That sample is typically tested with a dipstick method. For the urine specific gravity test, at least one to two ounces of urine are needed. Your doctor will give you a cup to collect the urine sample, along with antibacterial wipes to clean around the urethra which will reduce the chance of bacteria contaminating your sample. Once your sample is sent off to the lab, a technician will likely use a refractometer to project light into the sample to determine density, as opposed to using a dipstick. Home urine tests can be conducted but run the risk of becoming contaminated. There are also osmolality tests that are sometimes used to determine how the kidneys dilute and concentrate—osmolality is the index of concentration. This test helps diagnose certain conditions. When it comes to urine specific gravity levels, each lab sets standards; however, many labs set a normal urine specific gravity range between 1.020 and 1.028. If you have a specific gravity of urine under 1.030, it means you are still within the normal range. Discussing specific gravity units with your doctor can help give you a better understanding of what is and is not acceptable. In order to understand urine concentrations, just think about how much darker your urine looks if you haven’t had anything to drink for some time. Urine specific gravity levels will be lower if your urine is lighter and you are well hydrated. It is important to keep in mind that precise measurement of urine concentration can’t be determined by just looking at the color. High urine specific gravity can be an indication that you have extra substances in your urine—these substances could be glucose, bilirubin, red blood cells, white blood cells, crystals, bacteria, or even protein. Some conditions allow proteins to pass through the filters in kidneys, producing protein in the urine. Diabetes, heart disease, high blood pressure, Berger’s disease, Hodgkin’s disease, leukemia, and lupus can cause elevated levels of protein in the urine. 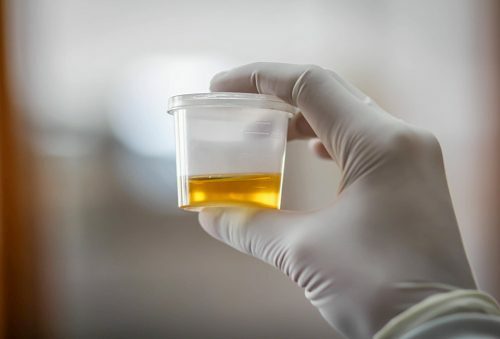 The urine density test may also be performed if a doctor suspects a complicated urinary tract infection, high blood sodium level, low blood sodium level, or excessive urination. Oftentimes, doctors will also check the pH of your urine. A urine pH level test looks at the acidity or alkalinity of a urine sample. Kidney stones tend to develop in a highly acidic or alkaline environment. Urine pH normal range is from pH 4.6 to pH 8.0. As I’m sure you can see, unlike some medical procedures, there are no side effects associated with a urine specific gravity test. It is a quick and easy test that should not cause any stress or discomfort. If you have a urinary tract infection, you will likely feel a burning or painful sensation when you urinate. You should always tell your doctor about all your symptoms, whether they are directly related to urination or not. If a urine specific gravity test shows that you are dehydrated, you may be given an intravenous of fluids to help hydrate you quicker. In the case of being overhydrated, your doctor will likely run further tests to determine if a heart condition, kidney condition, or metabolic disorder is the cause.